Second, there’s what we learn about who we are in the rest of our lives, through observing our own actions on the mat. In training we can step outside of ourselves and watch what we physically do – how we react (or overreact) to an attack, how we try so hard to make things work out the way we pictured, or how we just give up when things aren’t working out. 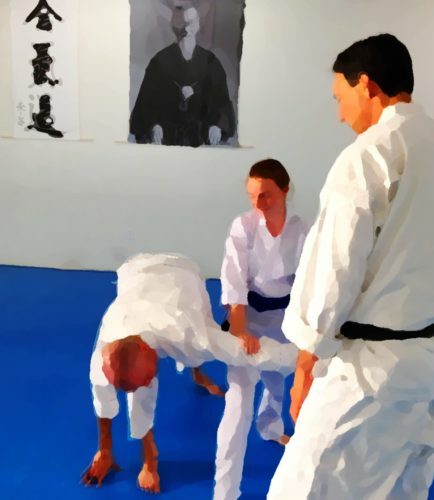 Our Aikido practice is a mirror – a way for us to see ourselves more clearly. In this way we can begin to understand how we act, respond, and relate in everyday life. It’s the latter, these lessons we learn about who we really are, that I’m speaking of here. In our training we can begin to see how we are in relationship to others in the contexts of conflict or authority, size or attitude, age or gender. How do we respond when someone strong grabs us in a rough, aggressive way? How does it affect us when a partner seems timid or nervous? Do we defer to our partner even when we hold a higher rank? Do we not quite trust them to fall safely, and so hold back in throwing them? Might we train differently with men, or assume a younger person can naturally handle more power? How we deal with things on the mat is often how we handle them in the rest of our lives, too. The dojo as a laboratory. Once these habitual behaviors, attitudes, and beliefs are revealed to us, we can begin to separate ourselves from them. They no longer have quite the same hold on us. We can bring them out into the light and examine them. Once they are visible we can more consciously choose whether they serve us, or not. We get to work on these things in the laboratory of the dojo, and then take into our lives. When is it appropriate to be nice about things, and when do we cross the line into being a self-sacrificing doormat? Can we find a way to be direct and powerful without being mean or pushy? Where do we stop in life? Is it when things get uncomfortable? When we feel we might be judged? Are we so afraid of physical pain that we won’t risk encountering it? Does the idea of demonstrating skills in front of everyone during an exam so petrify us that we quietly stop coming to class just before we qualify for our first test? Once we see these things about ourselves we can consciously work on them. We can choose to train with that big guy who scares us. We can experiment with being a little less “nice,” and see what happens. We can try things on for size and test ourselves, building new and more functional responses that we can then take with us into our daily lives. Everyone will learn something different. Your life lessons will come to you throughout your training, at uncannily appropriate times. You will look in the mirror that is Aikido and your own self will be reflected back at you. No one else can guess what you might see there. The things you discover on the mat – and how you choose to apply them in your life – will be all your own. You can find my thoughts on these books and others under My Recommendations > Aikido Books.